TRMK - Mortal Kombat News - Welcome EGM Readers! 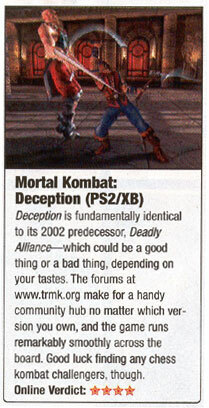 In the February 2005 issue of , EGM profiled fighting games featuring online play. Mortal Kombat Deception tied with Capcom vs SNK 2:EO for the fighting game with the best "online climax and community," with four stars each. In the article also mentions our own as being a "handy community hub no matter which version you own." To read the whole article, click on the thumbnail on the right. We would also like to welcome all newcomers to check out our comprehensive and invite them to join our community. Credit to Forum Member for the heads up, and Forum Moderator for the scan. Huge thanks go to the entire TRMK Forum Membership who have made our fourms one of the best. And not to mention the editors at for the excellent plug! Ya i just got that issue today and saw it. EGM is the best game mag in my opinion. I'm sorry I think OXM is the best.. very up to date on everything..